We do not know when the congregation of Ridgeway Baptist was formed but we know that the church was originally called New Bethel. It was built in 1865 by a handful of Confederate veterans after returning from the war. According to the local history, these builders were Wiley Pankey, J. C. Worley, Frank Nelson and Leander Corbin. The old log church was a one room structure with a dirt floor – a plank floor was added added at some point. There were two doors and three windows with shutters. An extension was added in 1940 and electricity was added in 1949. A new church, built in 1982, is located across the street from the log church. 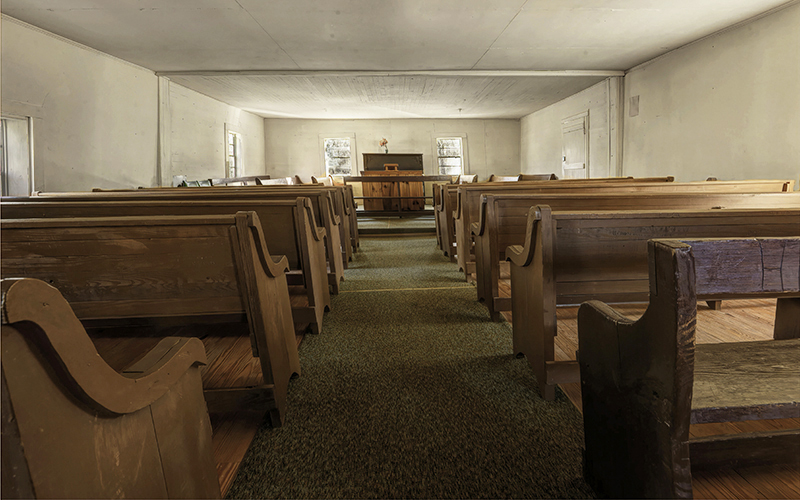 Early rural churches were built of local materials and reflected what the community could afford. A normal evolution of the church structure would be a brush arbor, then a log church and finally a framed sanctuary. 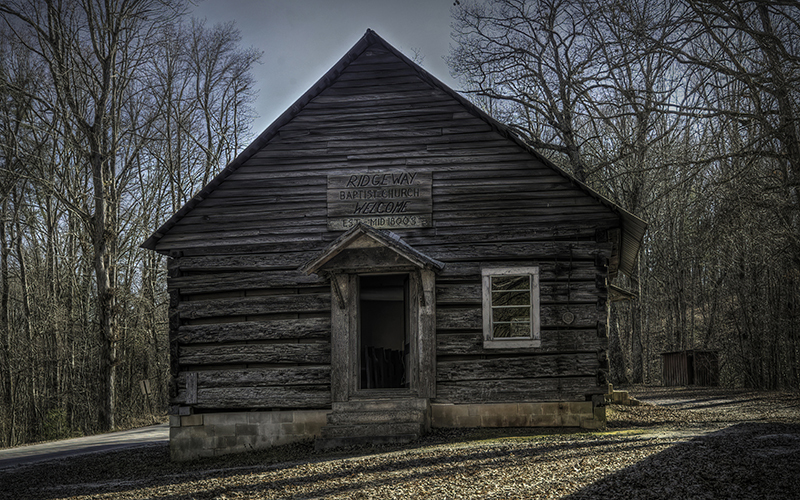 Many of the early church records in Georgia reflect this progression but very few of these early log churches have survived. This is one of them. Built at the end of the Civil War, it reflects the hard times these rugged mountain people faced at a time when relative prosperity had touched most of Georgia. 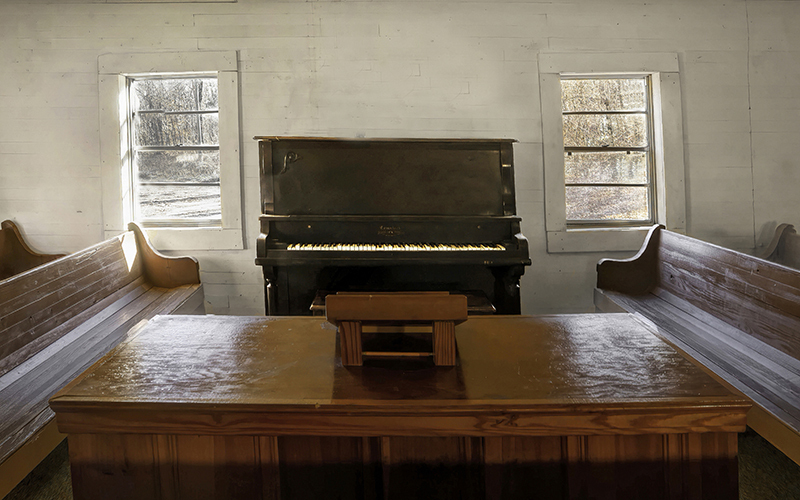 When you think of church services being held in the 1940’s in this small, sparsely furnished sanctuary with no electricity you get some sense of just how difficult the life must have been for this small group of hardy families. Of the 170 documented interments in the cemetery, 29 of them carry the surname Quarles, 21 were Pankeys and lots of them were descended from the early Scots Irish who moved into these highlands right after the Cherokees were expelled…names like McArthur, McClure, McElrath and McPherson are well represented. In the graveyard lie tales of the Civil War, moonshiners and murder. This was not plantation country and there were few African Americans in this part of Georgia. Cash crops, such as cotton, were just not an option. However, there was another opportunity for a cash crop and that was making liquor. There is a lot of history available regarding the federal decision to tax all whiskey sales and enforce this decision with federal agents, charged with putting the local stills out of business. This was the cause of much conflict in northwest Georgia, and that is reflected in the Ridgeway cemetery and the grave of Henry Worley – seen below in the final cemetery photo. It turns out that Gilmer County was one of several Georgia counties that was home to a self styled band of bootleggers that were known as the “Whitecaps”. They were modeled on the KKK but their purpose was to enforce their version of the mountain lifestyle and the proper way to live it. Part of the Whitecaps code was an adherence to the support of making moonshine, and making sure that a strict code of conduct was enforced. Apparently Mr. Worley was deemed to be a source of information to the despised Federal Revenue Agents. For this violation of the code, a large group of Whitecaps took him a few miles away and tried to hang him, but somehow he was able to escape and made his way back home to the Ridgeway Community. A few days later a smaller number of the Whitecaps returned and he was gunned down in his cornfield. Several of the Whitecaps were indicted but ultimately two of them, John Quarles Sr. and David Butler, were sent to prison with five year sentences. The judge reportedly reduced the original ten year sentences because of the poverty of the defendants and the fact that Quarles had fourteen children and Butler had eight. Mr. Quarles, however, died while incarcerated in the Columbus, Ohio prison and is buried there. The Atlanta papers covering the trial were full of front page tales of plain mountain folks being terrorized by this gang of vigilantes and how their power was now broken. It is quite a story, and here are a few links that contain more information. In the graveyard, Henry Worley’s daughter, Kemmie, is buried a few feet from her parents alongside her husband, Henry Quarles, whose uncle was the same John Quarles that was convicted and died in prison. All is peaceful now in the lee of the little log church they all called home. 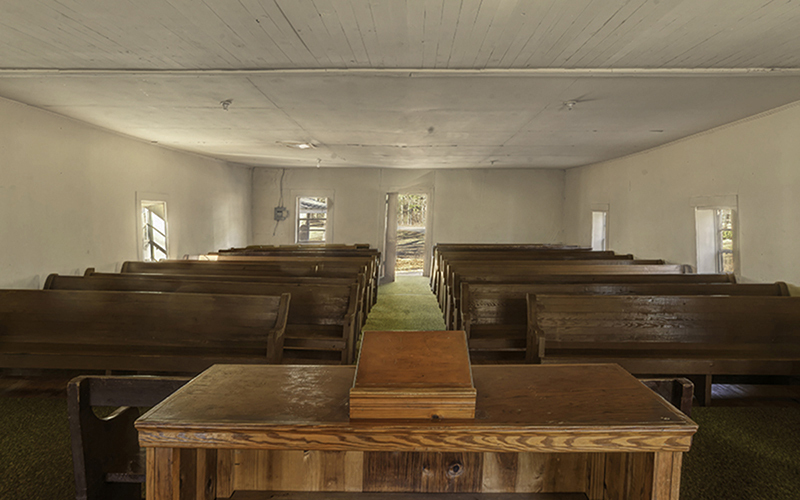 This photo accentuates the plain, rough and very simple interior of Ridgeway Baptist. The low roof and lack of any support columns reflects the lack of suspended trusses and sophisticated architectural techniques and/or design. It is a squat, rectangular, single room structure. The upper, mid-sanctuary exposed columns and beam are evidence of the churches original back wall and the 1940 extension. This log cabin was built by common men who, in1865, were returning to their old home area… broke and exhausted after the Civil War. The fact that Ridgeway still stands and is habitable is remarkable. Its congregation clearly has always treated the structure as a holy place. We are lucky and grateful that it remains as a monument of rural perseverance. This view of the chancel and pulpit area reflects many of the changes that have taken place at Ridgeway over its 150+ years. We see, by the exposed column next to the large, crude exit door, evidence of the churches expansion in the mid 20th century. This addition was used to provide a larger chancel/pulpit area for the sanctuary. 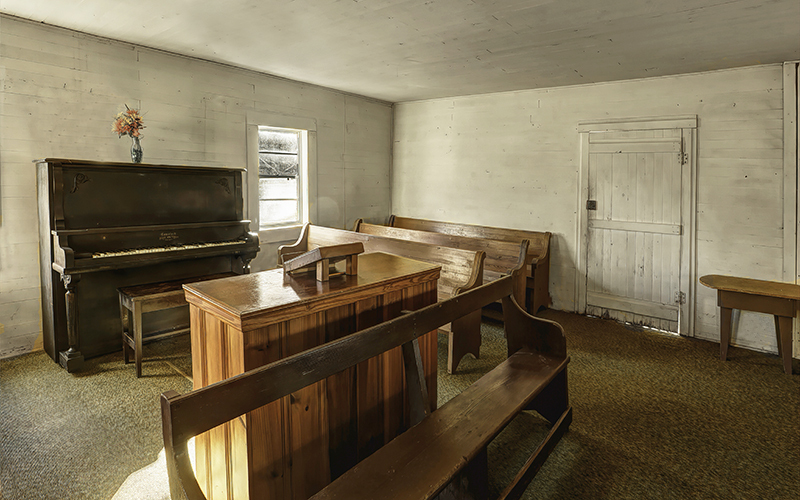 The homemade, simple pulpit, bench and pews in the Amen corner are authentic relics of earlier church history. This view from the pulpit has gone relatively unchanged for decades. The entry door, windows, narrow ceiling boards, pieced back pews and heart pine floors might have been in place since the original dirt floor was planked in the 19th century. The window frames, steel and glass jalousie windows are 20th century. Though the windows are small, you can see that they provide a great deal of ambient light. But, imagine how exciting it was when electricity was added in 1949 and evening services became illumined by incandescent lights, not oil lanterns. The main entry door, like the rest of the interior at Ridgeway, is prosaic. It is probably one of many that has been store bought to replace one that has worn out over time. You can see that this one is showing signs of wear, tear and weather. 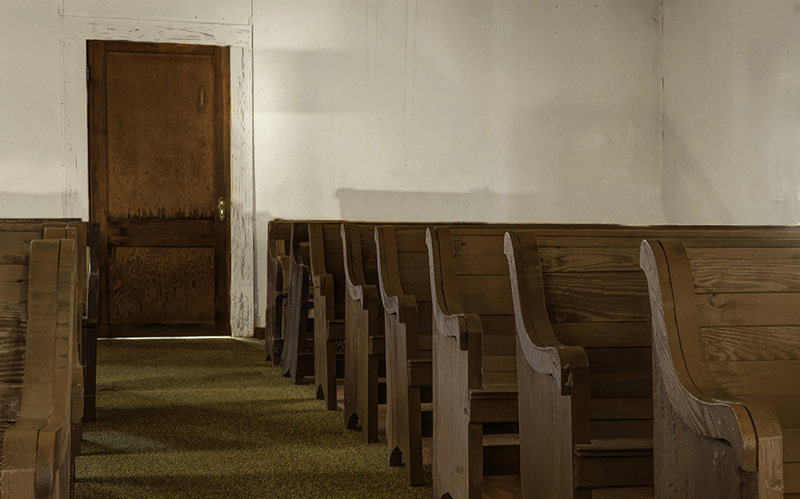 On the other hand, the pews do have lovely scrolled end caps and pieced backs.…one of the few decorative elements to be found in this old sanctuary. We do not know if these were store bought or hand made/assembled by a handy parishioner. Music and singing has always been an integral part of Baptist worship. Whether it be at a wedding, funeral, regular service, holiday service or other gathering, music was there. Here we see a 19th century upright piano that was probably bought in Dahlonega, Chattanooga or another nearby city. It would have been a costly but essential expense. Isn’t the light streaming into the sanctuary through the two windows and adding a lovely glow to the pulpit and pews lovely? In 1982, a new church was built just across the street from the log church you see above. That is tangible evidence of how much this old church means to its congregation. The fact that they wish to preserve the building and its remarkable heritage as a memorial to the past and share that history and story with others…. for generations to come… is worthy of praise. Thank you. 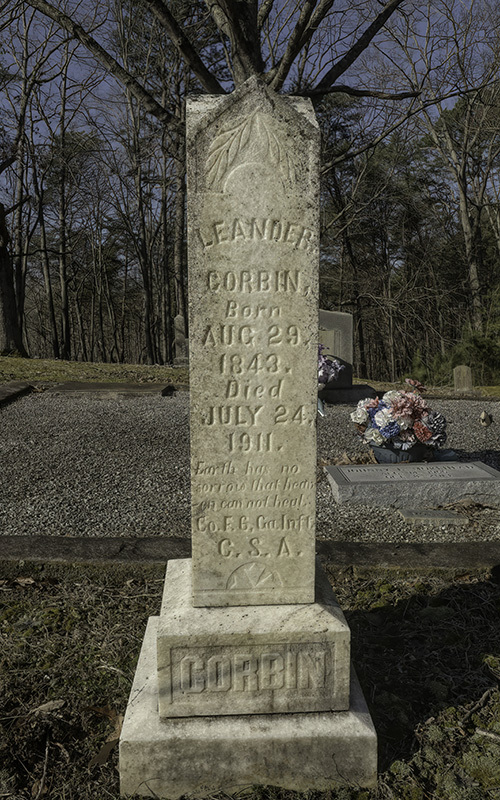 Leander Corbin was born in South Carolina August 29, 1843. He joined Company F, 60th Georgia Infantry, CSA on September 19, 1861. He was captured at Wilderness, Virginia May 6, 1864 and was released in March 1865. He surrendered at Appomattox, Virginia on April 9, 1865. His brothers Hamilton and M. C. Corbin were in the same company. Hamilton died in service January 15, 1864 and M. C. was captured at Cold Harbor, Virginia, June 27, 1862. Leander was married to Martha Louise Gates and they had four children. Leander helped build Ridgeway Baptist Church. 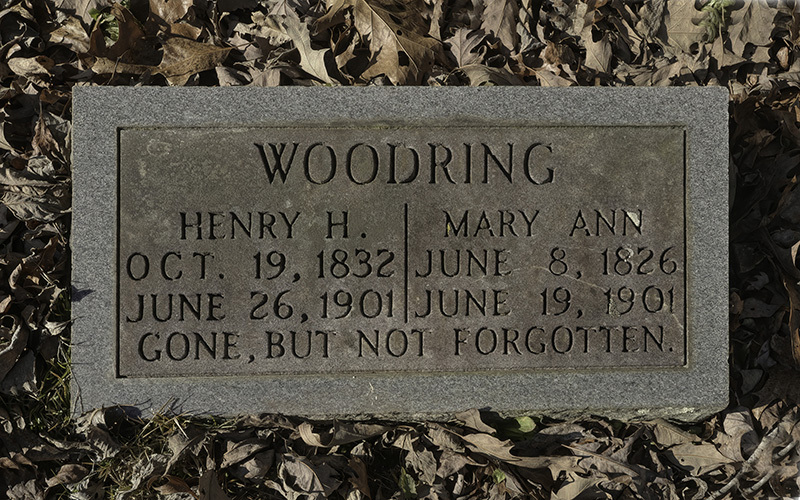 Henry H. Woodring was born in North Carolina October 19, 1832. He served as a sergeant in Company F, 11th Georgia Infantry, CSA. He was wounded at Gettysburg July 2, 1863 and at Darbytown Road, Virginia October 13, 1864. He was sent home on wounded furlough and unable to return to battle. He was married to Mary Ann Moore and they had four daughters. His parents, Daniel and Elizabeth Brown Woodring are buried at Ivy Mount Cemetery, Towns County, Georgia. 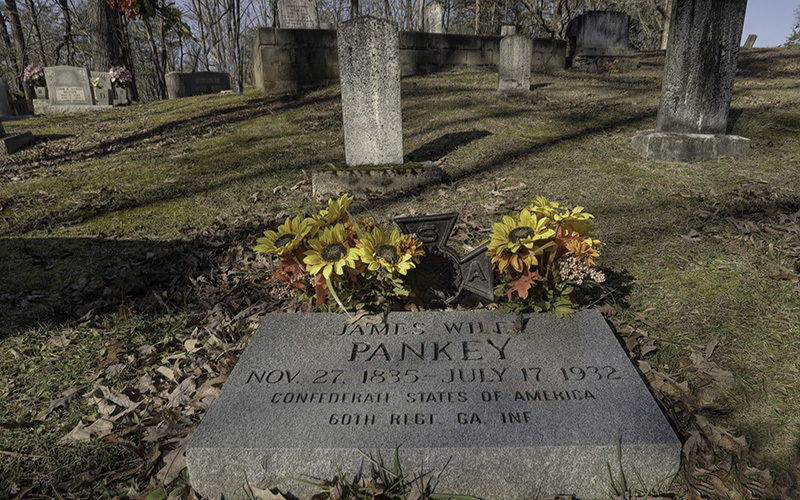 James Wiley Pankey was born in Georgia on November 27, 1835. He married first Juliann Ann Elder and second Nancy J. Barton. He started building the old log Ridgeway Baptist Church just after his return from the Civil War. Years later when plans were made to tear down the old log church, his second wife, Nancy, sat down in front of a bulldozer and would not let them tear it down. She said “As long as I live them logs will stand”. Wiley served in Company F, 60th Georgia Regiment, CSA. He was wounded in the leg at Petersburg, Virginia February, 1865. 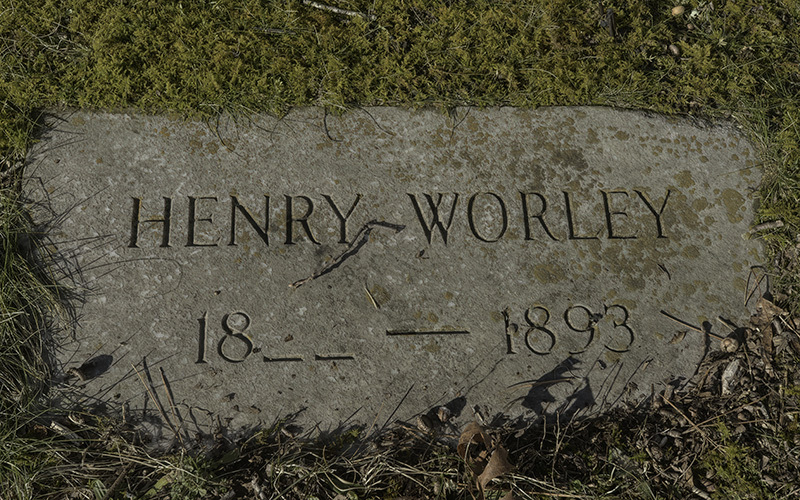 Here lies Henry Worley. He was laid to rest the day after he was murdered in his cornfield. Next to him lies his daughter Kemmie, who was with him that day. Next to her is her husband, Henry B. Quarles. Henry's father was the brother of John Quarles Sr. who was sent to a Columbus Ohio prison for the hanging attempt and the murder of Henry. The lives of the Worleys and the Quarles were very interconnected in this peaceful mountain setting. They still are. Wonderful to preserve the log cabin church. What prayers and praises were spoken here. Good for community, family, person and soul. My Great Grandfather , Wiley Pankey. History is so important. This Church holds so much within its walls. Is anything done or can anything be done as far as preservation? Thanks to John Russell for keeping this information alive. Great stories, friends! Does that mean we need tales of Whitecaps to pique our interest? No, but… it was marvelously/terribly time and place specific. Thanks to you folks. This one is a jewel, a gem.